I honestly don’t think that there will ever be a future moment in history as memorable, inspiring and politically current than when President Barack Obama eulogized State Senator Clementa Pinckney, who was one of nine victims in the June 17th, 2015 shooting at Emanuel African Methodist Episcopla Church in Charleston, North Carolina. And if there is – then I hope it will resonate as resoundingly in our collective minds, hearts and souls as what we just witnessed from President Obama a few days ago. 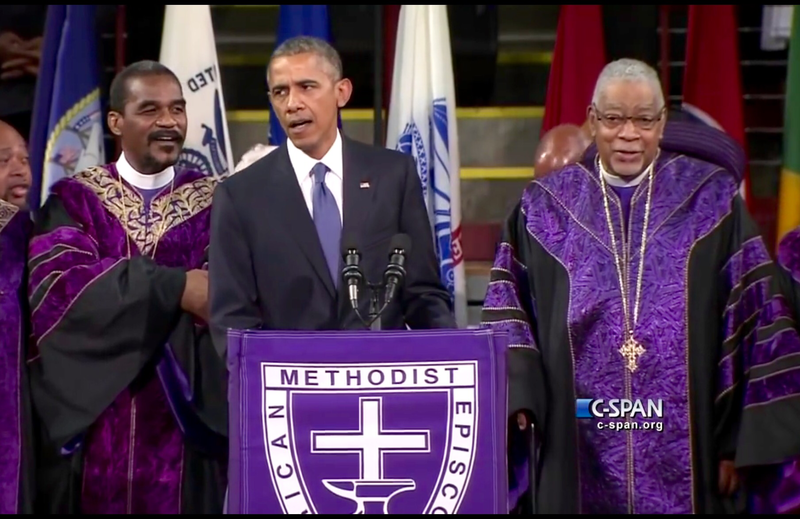 His speech and his rendition of “Amazing Grace” was a game-changer for this President. What we saw on that stage was a human being who, despite his stature and standing in the USA and in the world, was not afraid, but rather proud, to show the depth and the strength of his resolve to make the world a better place. We saw a real person, with real feelings and deep emotions. It was – for lack of the perfect word – magnificent. The majesty of that moment is indelible. And it came at the end of a week where President Obama made positive and permanent changes to health care and equality for all. Below, you will find an embedded video of his spiritually beautiful “Amazing Grace” rendition, followed by the complete eulogy. Please take the time to listen to both. It is a riveting watch and listen and LEARN – And what we have always come to expect in a true leader and visionary. MCL, so beautifully written. I could not agree more. It was a stunning moment. I have watched it many, many times. The entire eulogy was perfection. I am so proud of President Obama. Thank you for jump starting the article and for your kind words. i totally agree. i love that man. i had seen this before and it came as a surprise when he sang. and i too had to replay it and will do so again. he was perfection in his imperfection. i loved how he spoke differently at different times: he had the cadence of a ‘preacher man’ then he sounded presidential, i was just cheering him on. what a week it has been, in so many ways, amazing!! That pause was something else. Like he was willing himself to sing. Coming straight from his soul and out via his vocal cards. “Perfection in the imperfections”. Great phrase, Hunter. Inspiring. Thank you once again. It is my belief that he will go down in history as one of our best (and most successful) presidents, and most deservedly, too. Yes he will! When all is said and done, his strength and courage in the face of adversity will make him the best President in history. No one better, in my opinion. Yes, yes, yes!!! He has been a wonderful president in spite of all the adversity he has faced, I highly respect him and will be very sad when his term is up. It always amazes me when I read the negative comments about him. I, too, think he will be one of our best presidents.